I Have Common Core Writing Bundles! Hello friends! 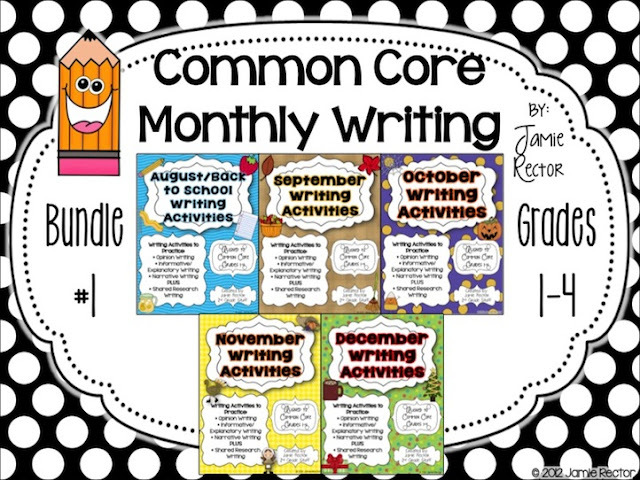 After many requests, I have bundled my Common Core Monthly Writing Activities to save you some money! However, because the files were large in file size, I had to create two separate bundles for them to fit onto the TPT servers. You can see them below. 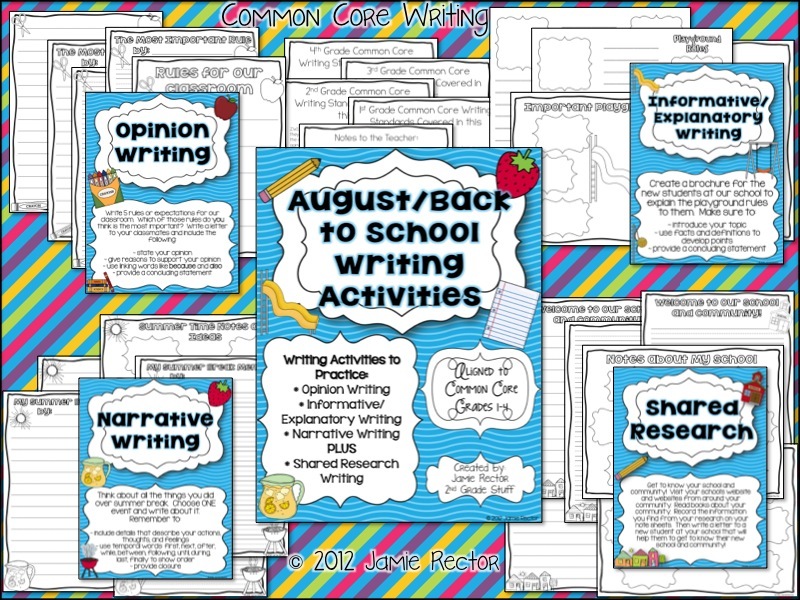 If you've never seen my Common Core Writing Packs or are just finding my blog, please skip down below the two bundle pictures and read the Q&A about why I believe these writing units help to develop strong, young writers. Cover Page Graphics by Ashley Hughes, Krista Wallden, and The Enlightened Elephant. Fonts by KG Fonts. 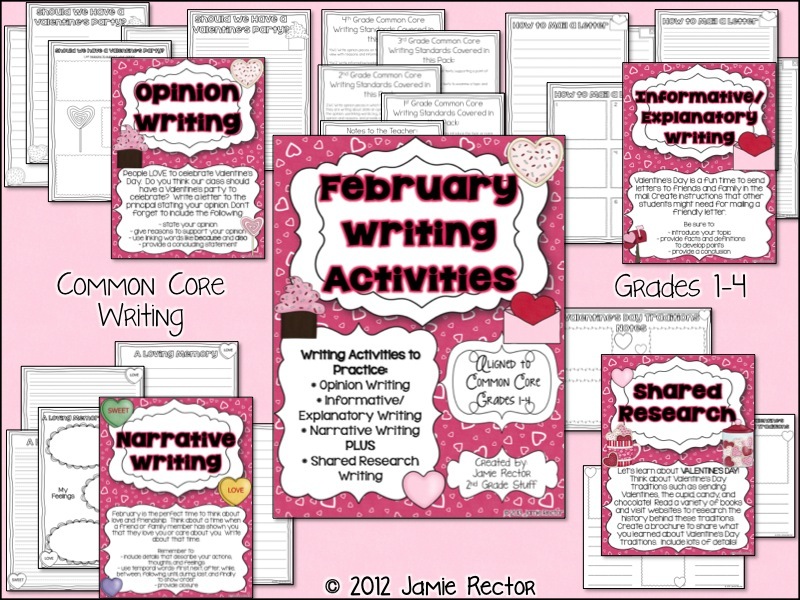 Why Monthly Common Core Writing Activities? I believe that writing is something that must be modeled, modeled, modeled by the teacher and then practiced, practiced, practiced by our students. Each of the Writing Units offer practice with all 3 types of Common Core Writing: Opinion, Informative/Explanatory, Narrative, PLUS Shared Research Writing (also in the Common Core Writing Standards and often overlooked). 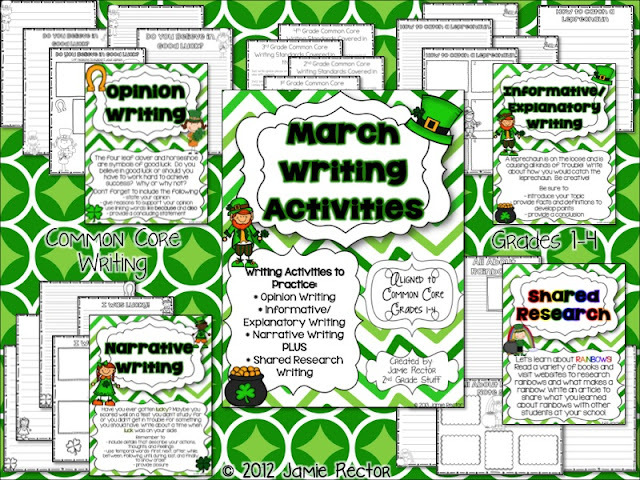 Your students can write one piece per week OR you can pick and choose writing pieces based on your students' needs or, even better, let the students choose! 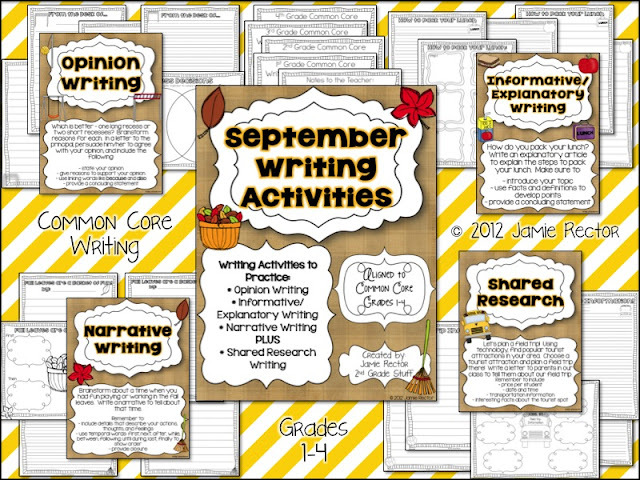 These activities will not "teach" the types of writing, but will merely give the students practice with each type of writing each month with a themed approach and real-life writing activities, many of which are cross-curricular integrating science and social studies concepts. 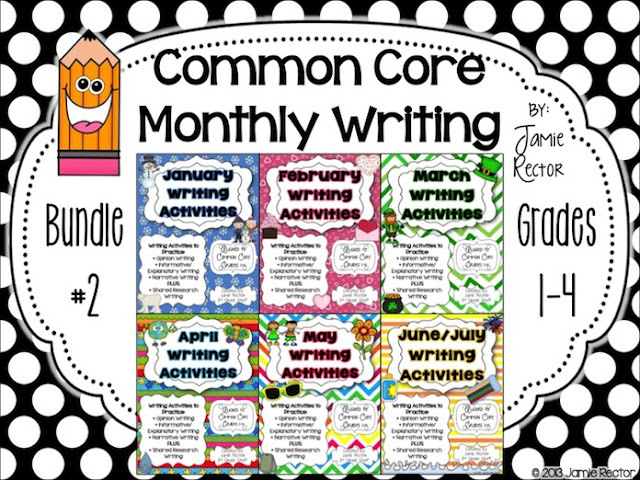 The Common Core Standards focus on preparing our kids for the real world and these authentic writing pieces will do just that! They are aligned to Common Core Writing Standards for Grades 1-4. I have included primary writing lines, as well as intermediate for differentiation purposes and various grade levels. With each activity, there is a writing task page (in color). This can be displayed on a projector screen, document camera, placed in a writing center, or put in a writing portfolio, binder, or notebook. Next, you will usually find some sort of graphic organizer or brainstorming/note sheet followed by the publishing pages and an extra page for the writers that get pretty lengthy with their pieces. 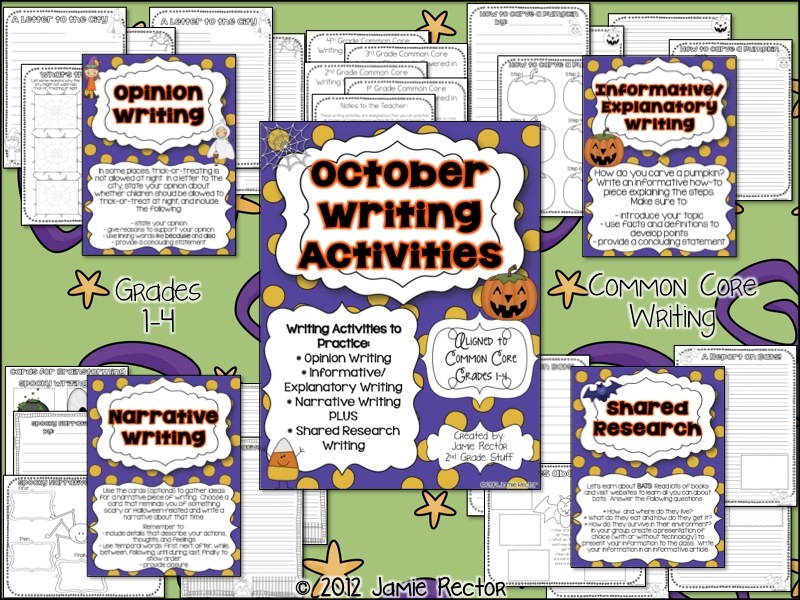 It's really exciting to revamp your writing curriculum in this way and it's also handy to show evidence of growth or lack thereof for evidence-based assessments or data tracking with your students. 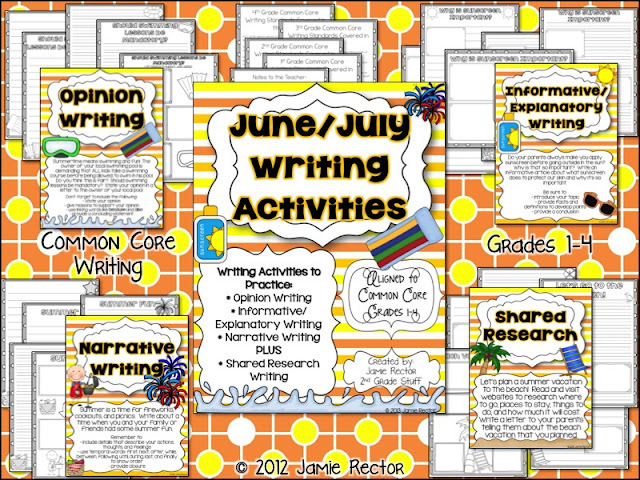 For example, keep a Narrative writing piece from September and compare it to a Narrative writing piece in May and note the growth in their writing. 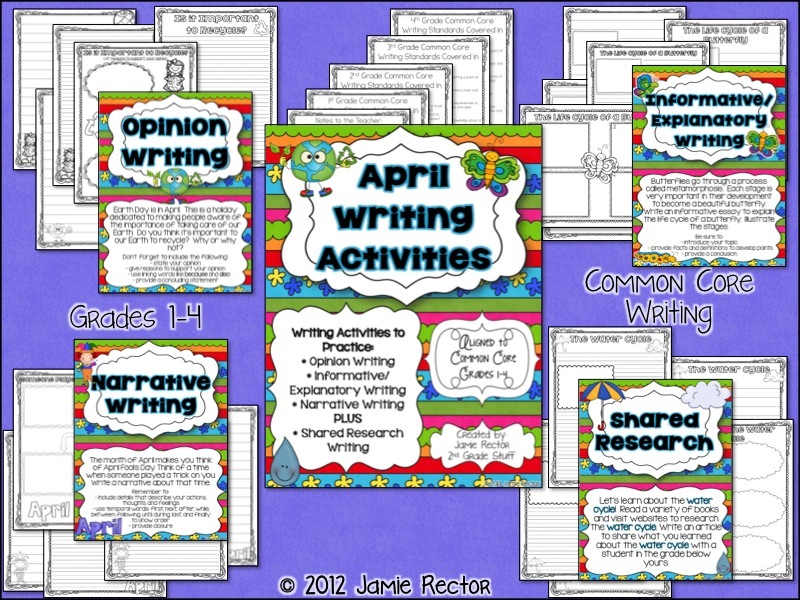 The best part: These writing activities can complement ANY writing curriculum or ELA program. 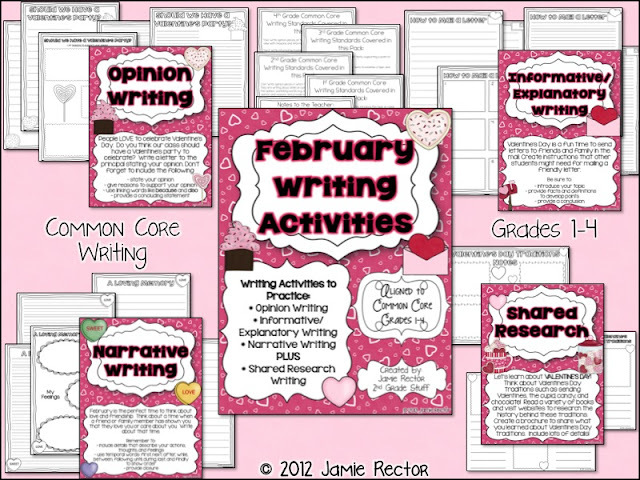 What Will My Students Be Writing About? Students will publish a brochure for new students at their school to explain the playground rules (informative/explanatory). Students will research and plan a field trip and write a letter to parents about it (shared research). Students will write a letter to the city stating their opinion on whether children should be allowed to trick-or-treat after dark (opinion). 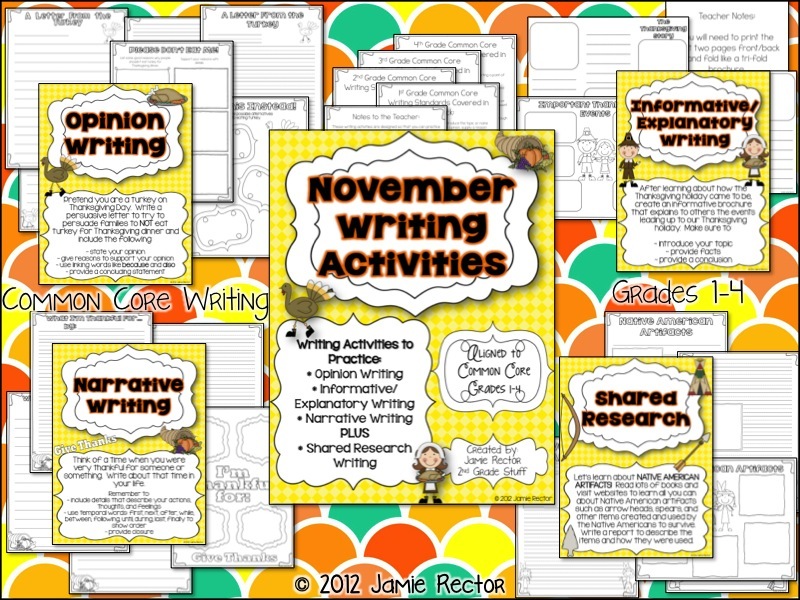 Students will write about a time when they were thankful for someone or something (narrative). Students will write a how-to article on how to wrap the perfect Christmas present (informative/explanatory). Students will write a letter to the superintendent stating their opinion on whether schools should be closed due to snow/hazardous weather conditions (opinion). Students will write a personal narrative about a time when they have felt loved by a friend or family member (narrative). Students will research and write an article about how rainbows are formed to give to another student in the school (shared research). Students will write an article about the life cycle of a butterfly (informative/explanatory). Students will write a letter to the school board, superintendent, or principal stating their opinion on whether or not students "need" a summer break (opinion). Students will research and carefully plan a summer vacation to the beach and write a letter to their parents explaining the information they have found (shared research). 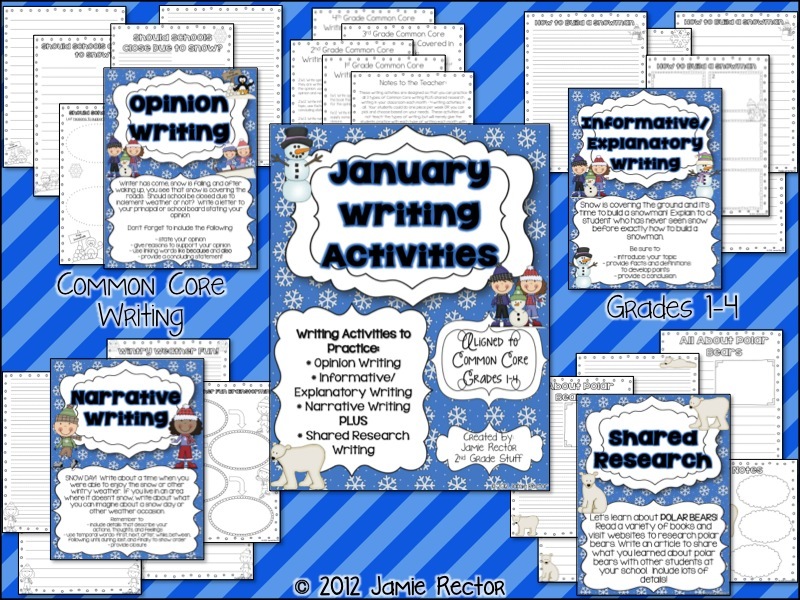 ALL these writing pieces and 33 more are included in this bundle! Can I Get a Preview? So you can see what's offered in the bundles, I am giving you a preview of each file included in the bundle (see below). Click the Preview Pictures below to enlarge the picture so you can see the contents more clearly. The link above each Preview Picture will link to the actual product in my TPT store, so feel free to click on over and check them out even further. 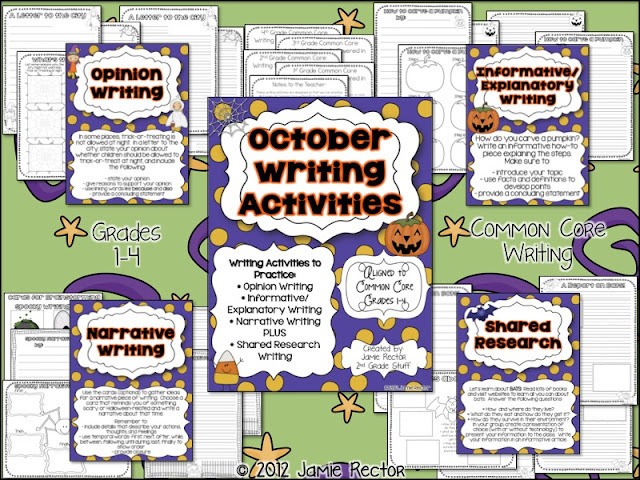 You might want to check out the Ratings & Comments tab for each Writing Unit to see feedback left from other teachers who have purchased these units. I think you will find that many teachers are finding great success using these products in their classrooms. 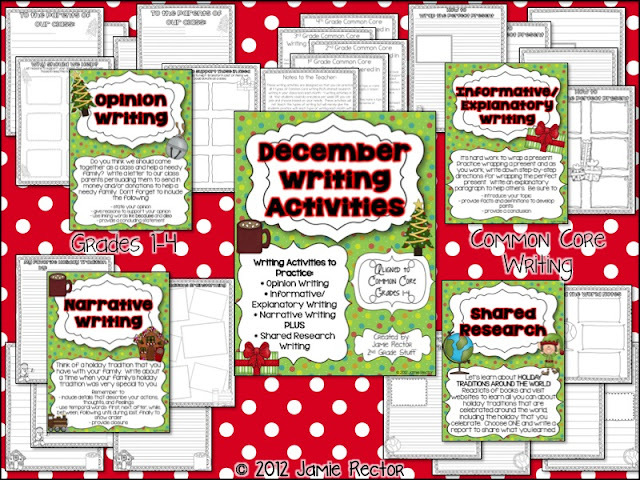 I hope you have enjoyed checking out these writing units or enjoy using them in the future. They were so much fun to create all year long and now I'm able to offer them at a discounted, bundled price which is even better! See the links up at the top of this post to check out the two bundles. Thanks, as always, for your continued support, awesome feedback, and sweet comments. Let me know what you think by leaving a blog comment below! These look great! I wish I was teaching in the classroom next year! I will make sure to pass these on to my colleagues! Thanks so much for all your hard work! I've already put both bundles in my cart. These are simply awesome! Wonderful product!! :) Thanks so much! I'm a 2nd grade teacher who enjoys creating standards-based curriculum and teacher materials for Grades 1-4. What Do the Kids DO During ELA Centers? 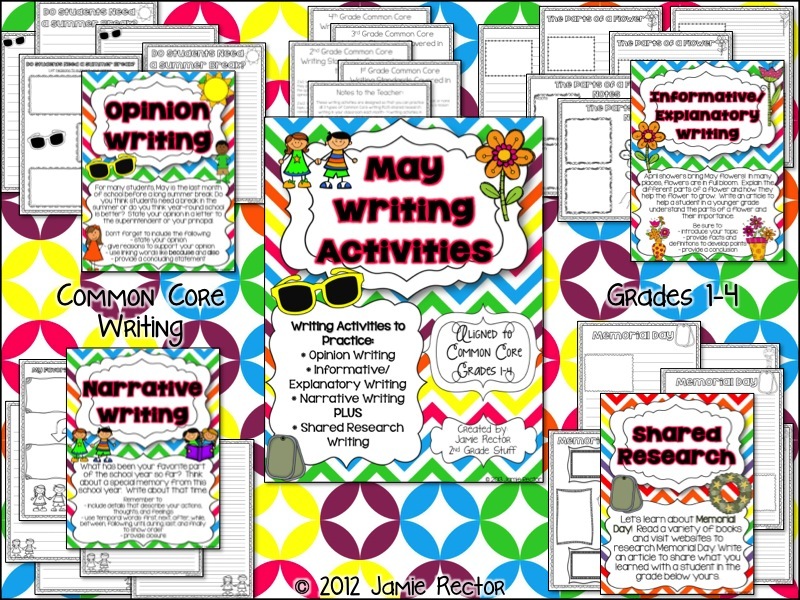 Avoid Stacks of Papers - ORGANIZE! We are a participant in the Amazon Services LLC Associates Program, an affiliate advertising program designed to provide a means for us to earn fees by linking to Amazon.com and affiliated sites. If you click on an affiliate link on this blog and make a purchase, Amazon will toss a few coins my way, at no extra cost to you, to help keep this blog up and running. Don't miss important news, updates, and free downloads! Become a 2nd Grade Stuff VIP today. © 2017 2nd Grade Stuff. Felicity Template designed by Georgia Lou Studios. All rights reserved.